Although the word 'vacation' is still a strange one to most ordinary Burmese inside the country, many Burmese in exile, including this correspondent, enjoy taking holidays. But it may be hard for the western community to understand why many exiles would spend their holidays on the Thai-Burma border rather going to Phuket or one of the other beach resorts popular with western tourists. According to Burmese dissidents in Mae Sot, about 100 exiles who have resettled in the U.S., Canada, Europe, Australia and New Zealand visited the border town last year. "Why do so many of you come here?" I was asked by a dissident who runs a restaurant in downtown Mae Sot. After 20 years far from home, I believe that many exiles come here to treat their homesickness. They want to see the Burmese community in Mae Sot, or "Little Burma" as it is sometimes referred to, and maybe take a look across the Moei River to Myawaddy on the Burmese side. For me, as an activist turned journalist, I wanted to learn what was going on in the dissident movement in Mae Sot and the rebel-controlled areas. In 1941, Mae Sot was a normal border village where the Burma Independence Army (BIA) was briefly based before re-entering the country to fight against British colonial rule. General Aung San and the rest of the 30 comrades led the BIA to Mae Sot and two other border towns on the route back to Burma after they were trained by Japanese army. I had read about the exploits of the 30 comrades in a school history book before coming to Mae Sot, which may be why some western analysts have criticized our romanticism in dreaming of following in general Aung San's footsteps. My first trip to Mae Sot was in mid-November 1988, just after the All Burma Students' Democratic Front (ABSDF) was founded. I came from southern Burma and stayed at the home of Major Soe Soe of the Karen National Union in Mae Sot before going to attend the ABSDF meeting at Kaladay Camp. Twenty years after my first trip, Mae Sot has changed a lot. The road to Myawaddy, on the Thai side at least, is now a six-lane paved highway where 20 years ago I walked in the dust. 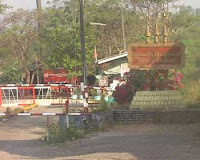 Major Soe Soe's house, where KNU travel passes were once issued for travel from Mae Sot to KNU headquarters in Manerplaw in Burma, without any questions from Thai authorities, is now the Peace Development office. But today, while the Major still screens and issues travel receipts, KNU travel passes no longer offer any guarantees on Thai soil. The KNU's general secretary, Pado Mahn Shar, was himself killed by unknown gunmen in downtown Mae Sot last February. Officials from the KNU's rival, the Democratic Karen Buddhist Army (DKBA), and Burmese government officials, travel to Mae Sot, which I never saw 20 years ago. Additionally, many Burmese dissidents have been arrested and some deported to Myawaddy, which I would never have thought possible two decades previously. Yet, despite many challenges, Mae Sot is still the hub of the Burmese dissident movement, especially after the fall of Manerplaw in 1995. I met and chatted with dozens of dissident leaders in Mae Sot. "After the killing of Pado Mahn Shar, no one is safe here. But we cannot use our own guards or guns as we did in the jungle on their soil," said an ABSDF leader who is now working for the Forum for Democracy in Burma. Although there is no security, "We must still work here. This is because Mae Sot is the closest place to Burma," he explained to me from his hideout. And it is not only politicians who choose to stay in Mae Sot but also social workers. "We must operate here as much as we can. I would never think of going to a third country," said Dr. Cynthia Maung, know as Burma's Mother Teresa, who runs the Mae Tao clinic off the highway between Mae Sot and Myawaddy. She was one of a few students whom I met at Major Soe Soe's house 20 years ago. I personally helped her to clean out an ageing mud hut to run as a clinic in 1989. Now I see about 100 patients on beds, 200 outpatients and about 30 new buildings beside the old hut that I helped clean. A dozen foreign medics, 50 Burmese staff members and an annual budget of 40 million baht (approx. US$ 1.14 million) are today overseen by Dr. Cynthia. "Twenty years on, Cynthia's battalion is the biggest in the Student Army," jokes a former ABSDF member who is currently working as a volunteer at the Mae Tao clinic. It is difficult to find hard evidence of how much the rebels and exile politicians have done for the people in past 20 years, although they claim to have been working for the country's 50 million people. "But in Cynthia's clinic, you will see with your own eyes how many people she helps," the former ABSDF member told me. "How many people have you helped with your own hands, my comrade?" he asked me while I was interviewing his patients. I could not answer him immediately. In fact, despite my 10 years as a freedom fighter and a further 10 years working in the media, I have never been able to help people physically like he has, but only through ideas or words. I was seized with the desire to do something to help when I met people from Tavoy, my hometown, who were living as illegal migrant workers along the border between Sangkhlaburi and Phuket, some of the two million Burmese migrants and hundreds of thousands of refugees on Thai soil. It was them to whom I once promised to bring freedom and democracy in a speech during the 1988 uprising. Now, 20 years later, I was meeting them on the Thai border, far from my home city, and I was somewhat ashamed that I had not yet honored my promise. In the end, the only help I could give them was the contact details of some social organizations run by comrades, such as Dr. Cynthia's Mae Tao Clinic (www. maetaoclinic .org), Aye Aye Mar's social network (http://socialactionfor women.blogspot.com/), Myat Thu's children's fund (www.aiyafund.com) and Moe Swe's labour rights group (http:// yaungchioo.org) in Mae Sot, Aung Myo Min's human rights group (http://www.hreib.com/) in Chiang Mai and Htoo Chit's organisation (http://www.ghre.org) in Phuket. Nevertheless, Dr. Cynthia was unhappy when I told her about my feelings, saying "Changing politics and ideology are more important than social work. We all are doing our duty and we shouldn't be blaming each other." Apart from politicians and social workers, I met another group of former ABSDF members who had been waiting for four years at No Poe Refugee camp to go to a third country. "We were all rejected by U.S. authorities because we were all ABSDF or armed men," one former ABSDF member who was visiting Mae Sot told me. "But they allow fake refugees in with no difficulties. Please tell the true story to the outside world," he pleaded. According to him, those rejected by the US can be divided into three groups. First, those, like him, who have been rejected by the U.S. but can apply to other countries. Second, those whose applications have been stalled but not yet rejected – meaning they can do nothing but wait. And third, the men who have been rejected by Washington while their wives and children were allowed to go to the U.S. – effectively splitting up the family. ABSDF and KNU officials confirmed that U.S. authorities have rejected all of their former members since the attacks of 11 September 2001. They also confirmed the allegations of 'fake refugees' and human trafficking. "[The camp authorities] let the new arrivals in from Rangoon who can pay a half million baht (approx. US$ 14,000) each to replace the old ones who have no money after living in the camp for many years," a KNU official told me. Unfortunately, I did not have enough time to investigate this accusation for myself. However, a Burmese journalist in Mae Sot gave me a different view. "As far as human trafficking goes, I agree that the UN and Thai officials need to investigate it urgently," he said. "But as for the meaning of refugee, I think all people in Burma today are suffering and in need of a refuge, so why are the dissidents opposing the new arrivals when they claim they are working for all 50 million [Burmese] people?" he asked. ABSDF and KNU officials are not only worried about being rejected by U.S. authorities but also about the changing mindset of former members who have resettled in the west. "Donations from our former members in the U.S. have been reducing month by month since 9/11," an ABSDF financial worker told me. Strangely, the highest number of donations is coming from Japan and Korea, where there are no former members of the ABSDF or the KNU. Change we need: Where is Burma's Abhisit? After a three-week vacation in Mae Sot, Chiang Mai, Sangkhlaburi and Ranong, I met some Burmese, Thai and western journalists in Bangkok. One western journalist began to question me. "Do you think there will be any change in Burma after the 2010 election? What is the role of the exiles in the coming election?" he asked. "Yes, there will be a few changes – from khaki uniforms to white shirts. Don't hope for too much," I replied. But as for the role of exiles, I'm not ready to answer that. However, a Thai journalist who has been following Burmese affairs for over a decade said, "The exiles are not interested in the 2010 election because they are all too busy with their own election," he joked, referring to a statement by the exile coalition who claimed to be founding a new government in exile in 2009. A Burmese journalist who was at the gathering suggested, "They should try to found a real government in Rangoon, not in exile. They also should learn some new methods from the new [Thai] Prime Minister Abhisit [Vejjajiva]". There have been at least 12 changes of government in Bangkok in the past 20 years while nothing has changed at all in Rangoon or Naypyidaw. Some observers have contrasted the rise to power of the 44-year-old new Thai premier Abhisit last month with the fate of 46-year-old Burmese 88 generation student leader Min Ko Naing, who was most recently jailed for 65 years in November. "That is why I suggested you look to Abhisit," the journalist went on. "Then you would find some creative ideas about how to break a 20-year political deadlock rather than holding on to traditional ways of thinking such as 'kill or be killed', or 'aggression or destitution'." Htet Aung Kyaw is a senior journalist for the Oslo-based Democratic Voice of Burma. He published a book last month in Thailand called, "Far from Home: 20 years in Exile".